Just in the last 25 years, the divorce rate for Americans over the age of 50 (known as a” gray divorce”) has more than doubled, and more than half of these couples have been married for more than 20 years. This now equates to one out of every four people divorcing. This is a huge shift from 1990, when fewer than one out of 10 people getting divorced were older. So why is this suddenly the case? These couples aren’t necessarily separating because they suddenly find each other dull, or due to infidelity, but rather that they have simply grown apart and want to go it alone. A number of couples stay together, unhappily, for years, assuming that this is what’s best for their children, and then finally realize they cannot be unhappy any longer. Many likely expect more happiness and fulfillment today than they did 30 years ago. Seniors are not only living longer, but engaging in more activities, such as travel. Before you consider remarrying, consider entering into a prenuptial agreement, as you will likely have even more financial issues to address at that point. When it comes to divorcing late in life, it is crucial that you consult with an experienced attorney so that you and your assets are protected. 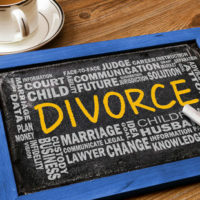 Contact our Florida divorce attorneys at Trachman & Ballot-Lena, P.A. today to find out more about our services.